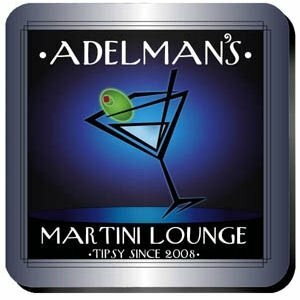 The contemporary and ultra hip coasters feature a Martini Lounge motif in a blue and black color scheme with a silver and light purple border. Our personalized coasters are a perfect accessory to any bar or family room. This set of four richly detailed, waterproof coasters show his good taste. Full color design is printed onto a non-skid cork base. Includes 4 coasters and mahogany caddy. Each coaster measures 3-3/4" square.